Benefits administration technology is reshaping the way employees engage with their benefits—and decision-support tools are a significant factor driving this change. To accommodate the needs of a diverse workforce, however, HR leaders must consider the quality and context of the tools and technology they leverage. Providing employees with direct access to a smart recommendation engine is an extremely effective, engaging, and cost-effective route to offering a highly personalized level of guidance and decision support. When utilizing a recommendation engine, however, it’s critical that the experience you offer is intuitive, quick to use, and can truly support employees’ enrollment process. Empyrean’s latest At-A-Glance explores the four must-have features for decision-support. Read on for a preview of some helpful tips and best practices from the guide. The majority of employees struggle to completely understand how their benefit plans work for their individual needs.1 Participants can easily become overwhelmed when trying to grasp all their options2 and frustrated by a lack of individualized support. Employees require personalized benefits experiences to help them identify their ideal coverage choices as quickly, completely, and individually as possible. A recommendation engine will personalize benefit offerings to employees’ needs and behaviors, and quickly eliminate barriers to comprehension and ease their frustrations. 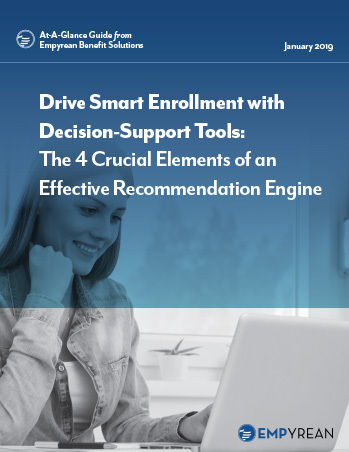 Seamlessly incorporating a recommendation engine into your benefits enrollment process will allow participants to gain insights into their individual coverage needs matched with eligible options when considering two or more plans. While standalone decision-support tools that operate independently from your employee benefits administration system may look great, they will ultimately fragment your benefits experience and extend the number of steps employees have to take to obtain sufficient support and complete their next open enrollment. On the other hand, a natively integrated recommendation engine fully ingrained within your benefits administration platform (and easily accessible on mobile devices) will provide a seamless experience to engage employees, provide them with recommended plans, and cater to their need for convenience and speed. Prompting employees with clear, lifestyle-based questions determines their medical and financial well-being, as well as risk appetite and behavior, without the unnecessary discomfort and anxiety that results from a poorly supported enrollment process. A smart recommendation engine uses machine learning to identify patterns in employees’ decision-making behavior and constantly adjust benchmarks to ensure employees receive the best benefit options based on real-time data – not guesswork or outdated information. Over time, the recommendation engine gains new data points that further inform and improve the system’s suggestions. This AI- (artificial intelligence) powered technology must be coupled with real user feedback and focus group testing to optimize support on both the front-end and back-end. This keeps the entire experience as useful, intuitive, and easy as possible. With each user interaction and enrollment cycle, your recommendation engine should learn more about how employees approach their benefits, and use this information to continually adapt and improve – no matter how your individual benefits or overall strategy may change over time. Packaging product recommendations takes your decision support further, not only matching employees with their best options for medical plans, but also providing recommendations for other major benefits (for example, employees may see a recommended package featuring medical, dental, and vision along with critical illness coverage and accident insurance, if offered). Packaged recommendations make it much easier for employees to engage with their benefits beyond just their health plan, to make smarter “big picture” benefits decisions while significantly streamlining the enrollment process. As employees review their plan matches, they should also have access to crucial information that will help them compare plans and make an informed decision. With just a few clicks, employees should be able to immediately receive a side-by-side breakdown of specific costs associated with each option – including the per-plan deductible, out-of-pocket maximum, in-network visit costs, urgent care costs, ER visit costs, and more. Enabling easy comparisons among plans helps employees expand their plan comprehension and gain an itemized financial perspective on their actual cost responsibilities as they vary by plan. The enrollment experience is a key moment to deliver critical benefits education that will not only build comprehension during the decision-making process, but can also help steer smart usage and increase satisfaction throughout the plan year. But employees can easily suffer from information overload if benefits education is not presented correctly, especially since enrollment can be an already-overwhelming process. Point-in-time education delivers only the benefits information employees need, right when they need it. This approach works by educating employees through helpful plan explanations and tools that support them and explaining particular benefits as they proceed through the enrollment flow. For example, an employee reviewing their HSA benefit during enrollment on the Empyrean Platform will also notice a quick benefits communication about what their HSA is and how it works alongside their HDHP coverage, should they choose to elect it. In addition, they’ll also have access to relevant tools, such as a calculator they can use to determine their potential tax savings based on their tax bracket and the amount they plan to deposit from their paycheck into the HSA over the course of the year. Point-in-time education delivers critical information that keeps employees’ experience top-of-mind, to ease their frustration and confusion rather than adding to it. To learn more about how the right recommendation engine and decision support can boost your success, download Empyrean’s new At-A-Glance Guide today. Read and discover how you can use technology to help guide your employees, drive your strategy, and deliver more positive benefits outcomes for both your workforce and business. “2017 Aflac WorkForces Report – Open Enrollment: Top Employee Findings.” Aflac, Inc. Columbus, GA. February 2017.